Augmented reality company Layar is celebrating its first anniversary in June with a plan to make the fledgling medium easier to use and part of everybody’s life in the years to come. An update to the iPhone version of Layar Reality Browser is coming soon. Layar’s smartphone software—which includes a free iPhone app—uses GPS, a compass, an accelerometer and a visual display recorded by the phone’s camera. It overlays the display with relevant information or annotations, called layers, on the display. The layers can, for example, show visitors in Berlin where the Berlin Wall was located, give directions to the nearest restaurant or show apartments that are for sale. “We have come very far in a short period, but we are still only at the beginning of all the possibilities that people can use augmented reality for,” said Lens-FitzGerald, who is convinced that the technology will eventually make it into everybody’s life. Today, Layar has about 2 million users. To get more users on board, Layar last week announced the availability of Reality Browser version 3.5 for Android-based smartphones. The iPhone update will be available soon, according to Layar. The new version adds a feature called Stream, which shows users all the layers that are available around them in a list view, and ranks them after user preferences and popularity. “While waiting for the bus or sitting at a restaurant waiting for a friend users can see what is going on around them, without having to go through the drama of holding up their phone,” said Lens-FitzGerald. Key to getting more users is convincing phone makers to pre-install the Reality Browser on their smartphones. Samsung’s forthcoming Galaxy S will come with the client. More deals are in the works, but Layar isn’t ready to give any details, according to Lens-FitzGerald. To help developers, Layar has set up a partner network. Up until now layers have been free for users. 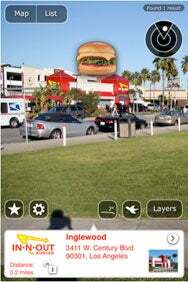 The recent addition of paid layers will also help make Layar’s platform even more attractive. “You can now spend two months on developing a cool augmented reality game or a tourist guide, and then make money on it,” said Lens-FitzGerald. Layar’s store is integrated into the Reality Browser, and can now accept payments from users in the U.S., U.K., Canada and Australia. More countries will be added as soon as can get payment methods in place, according to Lens-FitzGerald.